The Royal Railway Safari begins in Cape Town with three nights at 21 Nettleton. An elegant mansion with Lion’s Head as its backdrop, this residence is far more than 5-star accommodation, it’s an opportunity to be treated like royalty while exploring all that the city has to offer. From the Mother City to the food and wine heartland of the country, Franschhoek, for two nights. Situated in the heart of this beautiful town, La Residence offers guests warm hospitality, the finest wines and world-class cuisine courtesy of award-winning, internationally recognised chefs. The next leg of this adventure involves a journey from Cape Town to Pretoria and a truly exceptional mode of transport – The Blue Train. “The ultimate in luxury rail travel since 1946,” this is an overnight stay guaranteed to create memories that will last a lifetime. After disembarking from the “5-star hotel on wheels,” The Residence in Johannesburg serves as ‘home’ for the next 24 hours. Synonymous with warm hospitality and modern city grandiose, this one-of-a-kind boutique hotel offers compelling tranquillity in the otherwise fast-paced city. From ‘the city of gold’ to the Sabi Sands Game Reserve where three nights at Londolozi Pioneer Camp await. The penultimate destination on this safari, this camp is the most secluded of Londolozi’s camps, offering three private suites with superb river views and breath-taking game watching opportunities. From one extraordinary game reserve to another, the final check-in on this safari takes place in Thornybush Game Reserve – 13,000 hectares of Africa’s finest bushveld – in the form of a three-night stay at Royal Malewane. Offering its guests a sophisticated combination of personalised service and privacy, this colonial masterpiece not only promises “the best game viewing Africa has to offer” but combines modern comforts with traditional extravagances to guarantee that this 14-day safari ends on a luxuriously high note. Guests will be met at Cape Town International Airport and transferred to the stunningly beautiful 21 Nettleton where they will spend the next three nights in pure luxury. Stay at one of the most enviable addresses in Cape Town. A mere 10 minutes from the V&A Waterfront and nestled against the slopes of Table Mountain’s Lion’s Head, in one of the finest positions in Clifton, this elegant mansion has much to offer. With its serene landscape, attractive decor, private decks, swimming pool and beautiful gardens, guests have the opportunity to enjoy the privacy that this residence offers. The spacious residence offers five exclusive suites and a spectacular penthouse with unrivalled views of the Twelve Apostles mountain range abutting the Atlantic Ocean. Everything about 21Nettleton is enchanting and if you are looking for a “view” there is simply no better choice in Cape Town. 21 Nettleton is a mere 10 minutes away from Cape Town’s legendary Victoria & Alfred Waterfront, Table Mountain and the city centre, yet away from the hustle and bustle of the city streets. Explore the city and surrounds by day and escape to the tranquillity of 21 Nettleton. After breakfast guests will be transferred to La Residence in the beautiful town of Franschhoek where they will spend the next two nights in pure bliss and luxury. The Vineyard Suites offer complete flexibility, comfort and superior service to make holidaying with family and friends effortless and enjoyable. 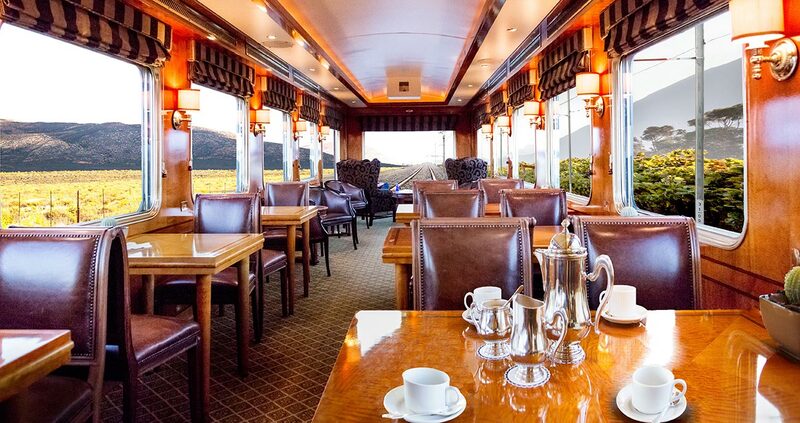 Today guests will be transferred to the Blue Train Station, from where they will board one of the most luxurious trains in the world for a night of luxury and relaxation. A once in a lifetime experience. Guests will be met at the Blue Train Station in Pretoria and transferred to the lavish and exclusive The Residence in the city of Gold, Johannesburg, where they will spend the night. The final word in modern city grandiose, the Residence represents compelling tranquillity in the otherwise fast-paced city of gold (Egoli). This luxury estate is conveniently located to allow access to the city (both Johannesburg central and Sandton) as well as a variety of nearby attractions. Whatever your day may entail, rest assured – you’ll savour your return. Get active in the sparkling pool or on the tennis court. Soak up the South African sunshine on the luscious lawns. Play a round of golf on the greens of nearby Houghton golf course. The Residence is a one of a kind boutique hotel. No effort has been spared in creating the most exquisite surroundings that surpass your greatest expectations. Whether you are a business professional with a demanding executive schedule or a leisure traveller with time to spend at your own discretion, they are there to ensure that your stay with them will be memorable. A warm, hospitable welcome awaits you at The Residence, located in the historic suburb of Houghton, which is also home to many famous residents including former president Nelson Mandela. This is a blissful oasis where guests are treated with personalised service and are invited to make themselves at home. The 18 suites are individually designed and decorated with the sole purpose of surpassing expectations. In addition to a full en-suite bathroom, every suite has its own outdoor rain shower and outdoor bath, or Jacuzzi overlooking terraced gardens and forest-like surroundings. After a scrumptious breakfast guests will be transferred to OR Thambo airport from where they will board a shared chartered flight to the world famous, breathtakingly beautiful Londolozi Tree camp, your home for the next three nights. You will be transferred after a succulent breakfast to the stylish, luxurious and breathtakingly beautiful Royal Malewane Lodge, situated in the Timbavati Game Reserve, your home for the next three nights. Each of the eight freestanding suites combines all the most modern comforts with traditional extravagances, like Victorian claw-foot tubs and cozy fireplaces. The piece de resistance? Unmatched views. The caring and experienced staff knows what you want even before you do, and they’ll make you feel wonderfully at home. Elevated walkways link the suites to the main camp, below which animals cavort and graze. Privacy is paramount here, and the only neighbours within sight of your private veranda are the elephant and giraffe herds that amble around the property. And for families and groups of friends, Royal Malewane’s Africa House is absolutely ideal. Situated just a few minutes’ drive from the main lodge, this fully-staffed house provides all the comforts of home for up to twelve people, including a courtyard and veranda, generous living and dining area, large pool, boma for dinners under the stars, and a private chef, butler, ranger and tracker. After breakfast, you will board a short chartered flight back to OR Tambo from where you will be heading home after a holiday fit for a King.